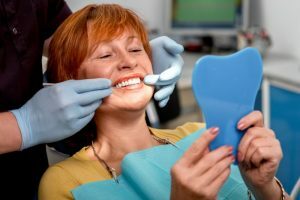 Whether you’re considering dental implants or you’ve just had an implant-retained restoration placed, you should know that they don’t require special maintenance to make last. With the right at-home oral care, routine dental visits and other habits you should avoid in mind, making them last 10, 20, 30, and even 40 years from now will be incredibly simple and straightforward. Consider your dental implants in Temple a fresh start to keeping your mouth clean and teeth healthy for years to come! If you experienced tooth loss because of a poor oral care regimen, a dentist will be the first one to tell you how important keeping a strict routine truly is to making teeth last, natural or not. All patients need to brush at least twice a day for two minutes at a time and use fluoridated toothpaste to do so. Fluoride is the active ingredient responsible for preventing decay and gum disease, so make sure it’s listed in the active ingredients on the back of your toothpaste. You’ll also need to make sure you floss around the implant to remove loose food debris and plaque. Without flossing, you risk allowing bacteria to breed and multiply around your implant, increasing the risk of an infection later. While the implant-retained crown cannot develop cavities, the gum tissue surrounding it can certainly become inflamed. Remember this the next time you think about going to bed without doing your routine. Dentists aren’t only looking at your natural teeth when performing their examination. They’re always checking on your restorations and making sure they don’t need to be replaced due to damage. It also gives you a chance to confirm that your at-home care has been sufficient enough to keep the implant and crown in good condition. Furthermore, there’s always the possibility that you develop a teeth grinding habit that you were unaware of until visiting your dentist. Chronic teeth grinding and clenching can easily cause the restoration to wear down prematurely, costing you more money for a replacement in the future. In this case, a nightguard can easily prevent that from happening. Making your dental implants last is easy when you know the proper self-care steps. Schedule an appointment with a dentist in Temple to see if your at-home care is up to par! Dr. Richard Fossum is able to provide all parts of the dental implant procedure entirely in-house, making your treatment even more convenient. If you’re considering dental implants or simply have a question about keeping them maintained, you can contact him through his website.